File photo of the Heart of Saint Laurence O'Toole relic and reliquary. A SAINT’S HEART and fragments of the ‘true cross’ were just two of the high-profile relics thefts in Ireland last year. Decorative crosses said to contain fragments of the cross on which Jesus was crucified were stolen from Holy Cross Abbey in Co Tipperary in October 2011. The items, made from silver, gold and bronze, were later recovered and had not been seriously damaged. 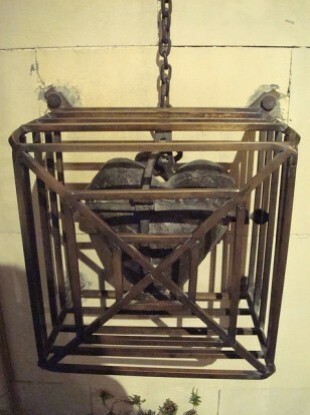 The preserved heart of Saint Laurence O’Toole was stolen from Christ Church Cathedral in Dublin city in March. The relic, dating from the 12th century, has not been recovered despite repeated appeals. Meanwhile, a relic known as the Precious Shrine of St Manchan was stolen from a church in Boher, Co Offaly, and was recovered shortly afterwards by gardaí. But what is a relic? The word relic comes from the Latin word ‘reliquiae’, meaning ‘remains’ or ‘something left behind’, while a reliquary is a shrine that houses a relic, or relics. A first class relic is one associated directly either with Jesus’ life (ie a piece of the true cross) or the physical remains of a saint. Generally, a martyr’s relics are more highly venerated than those of other saints. A body part which specifically related to a saint’s life is more prized as a relic. A second class relic is an item that the saint wore or frequently used, such as rosary beads or a prayer book. A third class relic is any object that has been touched by a first or second class relic. Relics, and their veneration, are reminders of the lives of the saints and are supposed to point worshippers in the direction of God. Under Canon Law, the sale of relics is strictly forbidden. Canon Law also states that relics “of great sigjnificance” or which are “honoured with great reverence by the people” cannot be transferred on a permanent basis without permission from the Holy See. How have ancient relics survived in Ireland? “One of the most characteristic things about relics in Ireland is that they tend to have been preserved by what are known as ‘hereditary keepers’,” the National Museum‘s Head of Collections Raghnall Ó Floinn said. The family entrusted with the bell had their name inscribed on the bell’s shrine (or protective container), which dates from around 1100. There was a “changing of the guard” in the management and ownership of relics in the 19th century, as collectors increasingly acquired items entrusted to private families for their preservation. However, others have been held by religious communities for centuries. St Oliver Plunkett’s head is one of the best-known and most-visited relics in Ireland. The relic is housed at St Peter’s Church in Drogheda, while other parts of his remains are venerated in dioceses in England and Germany. Plunkett was executed in July 1681. Although his head was thrown on a fire, it was quickly recovered by some of his companions and taken to Rome. Decades later, it was returned to Ireland and secretly stored in a special casket in a grandfather clock by Dominican nuns at the Siena convent in Drogheda for safekeeping during years of Catholic persecution in Ireland. Among the National Museum’s collection of relics, Ó Floinn says that the most important are the Cathach of St Columba (a book shrine said to contain a fragment of the psalms which dates to around 600AD; the manuscript is thought to have been written by St Columba) and the Bell of St Patrick. A lot of the Irish reliquaries have actual inscriptions on them so they give the names of the individuals who had them made, like Brian Boru’s son for example. He had a covering made for one of the book shrines. Sometimes these people are otherwise not mentioned in records and it means that we can fix them in a particular time or place through the inscription. Are more likely to show up? Because of the reverence and veneration associated with the relics and the reliquaries, many were not sold off or melted down as other valuable metal objects have been through the years. “You wouldn’t have much in the line of secular silver plating from the Middle Ages because when you’re strapped for cash, you literally sell the family silver for melting and reusing,” Ó Floinn said. Most of the items which turn up unexpectedly from that period now tend to be things like swords or axes and Ó Floinn said it is unlikely that there are many valuable relics which remain unaccounted for. A bishop’s staff was found in Lismore Castle, Co Waterford during renovations of the property in the early 19th century. The crosier, which bears an inscription linking it to an 11th-century abbot in Lismore, was apparently blocked up in part of the old mediaeval castle for safekeeping during the Middle Ages. The most recent to have been accidentally discovered were a book shrine found in fragments by divers in Lough Kinale, Co Longford in the 1980s and another one found by a Lough Erne fisherman around 1900. However, a number of relics which were recorded in ordinance survey research during the 1830s remain unaccounted for and it is possible that they were passed to other families or collectors since – or were taken out of the country by people emigrating in the Famine years. Ó Floinn says that there are no known cases of this happened to valuable Irish relics, but it is a possibility. Email “Ireland's ancient relics - what are they and how have they survived?”. Feedback on “Ireland's ancient relics - what are they and how have they survived?”.